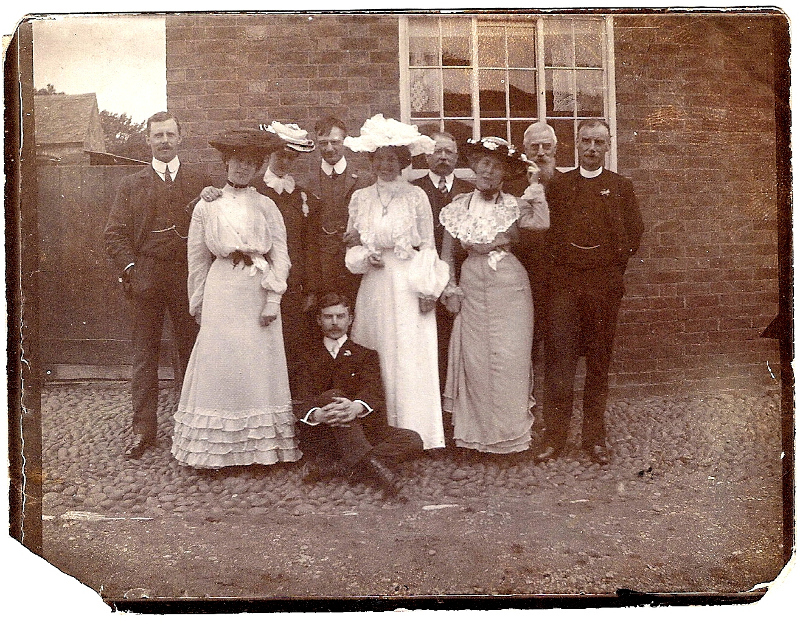 Wedding Photograph: Wedding took place on 3rd June 1903 St Helena church, West Leake. From left to right: Edgar Knight; Ethel Knight; Agnes Knight; Harold Knight; Laura Knight; Arthur P. Bates; Eva Johnson; William Knight; the vicar and the best man Fred Milmine. Before the wedding Laura lodged on a farm with Mrs Jones ( a distant relative) in East Leake, where Sis also stayed just before the wedding and where the reception took place. At the time Harold lodged nearby with a Mrs Platt of Schoolside Farm in West Leake. Mrs Platt’s husband is understood to be Thomas, who farmed 28 acres at the time rented from Lord Belper.